The Ice Storm challenge is back on! Yesterday, Epic Games introduced a new challenge into Fortnite: Battle Royale that was nearly impossible. 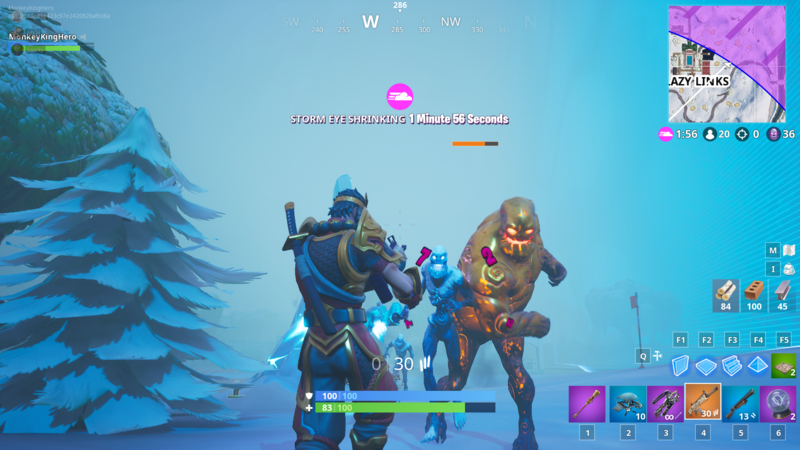 As part of the new Ice Storm event, Epic Games wanted players to kill 20 Golden Ice Brutes that rarely spawned in regular matches. In fact, most players claimed they only found one or two Golden Ice Brutes after hours of playing the game. This led to some players, understandably, fuming at Epic Games and asking the team to change the spawn rate—and it looks like the company listened. While Golden Ice Brutes are still impossible to find at the start of games, the same can’t be said after the first Blue Circle has closed in. We at least have been able to find Golden Ice Brutes more often and in the past three games we have played, we have found three Golden Ice Brutes in each one, making the challenge that bit more bearable. Some players on Reddit have also seen an increase in Golden Ice Brutes as well. The Golden Ice Brutes tend to spawn more after you clear the first wave from a surrounding Ice Pillar. The later the game goes, the more chance that a Golden boy spawns from the get-go. You still need to kill 20 of them to complete the challenge, but the change is surely welcome. Of course, it’s still a pain to do and should take some time, but at least the challenge isn’t nearly as impossible as it was yesterday.